The Commission on Narcotic Drugs (CND) of the United Nations Office on Drugs and Crime (UNODC) convened for its 58th Session during March 9-17, 2015. Ambassador Károly Dán presided over the interactive discussion on Drugs and Human Rights. 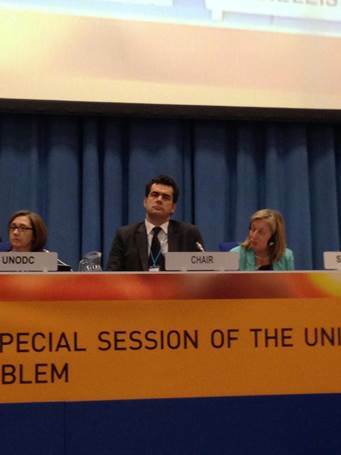 The Commission on Narcotic Drugs (CND) of the United Nations Office on Drugs and Crime (UNODC) convened for its 58th Session during March 9-17, 2015, at the Vienna International Centre. The 58th Session took place in anticipation of the upcoming special session of the United Nations General Assembly on the World Drug Problem (UNGASS), set to take place in April 2016. Bringing together approximately 1,000 participants, composed of national delegations, inter-governmental bodies, civil society groups, and the media, the 58th Session provided fertile ground for a comprehensive consideration of international drug control-related matters. Over the course of the event, a broad array of issues were addressed, ranging from protecting the youth population from the sale of New Psychoactive Substances (NPS) over the Internet, to combatting financial flows linked to illicit drug trafficking. By the conclusion of the Session, eleven resolutions and one decision were adopted, representing the culmination of a collective effort to address the global drug problem. Ambassador Károly Dán of the Permanent Mission of Hungary to the UN successfully chaired an interactive panel discussion on March 12th, which covered a variety of issues relating to the socioeconomic aspects of drug use, the creation of sensitive and balanced drug policies, and effective inter-agency cooperation. The Hungarian government was represented over the course of the 58th Session by diplomats from the Permanent Mission of Hungary to the UN, as well as representatives from the Ministry of Human Capacities and the Ministry of the Interior.